Come see Z6 Commissioning at RCI’s 33rd International Convention & Trade Show in Houston, Texas from March 22-27! Stop by our Booth 221 to learn how Z6 can work with you to provide building envelope performance assurance and discover our testing capabilities, newest innovations, and hands-on demonstrations of our Blower Door test, as well as presentations on Electronic Leak Detection and Roof Uplift. 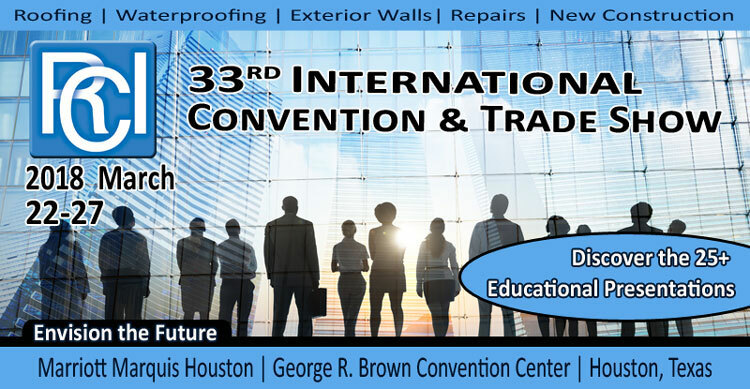 This convention is the premiere event for building envelope consultants who specialize in design, investigation, repair and management of roofing exterior wall, and waterproofing systems with an opportunity for attendees to earn a full year’s worth of continuing education credit! This six day conference will bring together over 130 exhibitors and 1,300 attendees, featuring over 25 hours of educational seminars, live product demonstrations, and a two‐day trade show. Earn CEHs for Attending the RCI Trade Show! Attendees will earn 2.0 CEHs for spending up to four hours on the trade show floor. Attendees who spend more than four hours at the trade show will receive 3.0 CEHs. For more information or to register for this event, click here to visit the RCI 33rd International Convention & Trade Show website. We’re looking forward to seeing you in Houston!